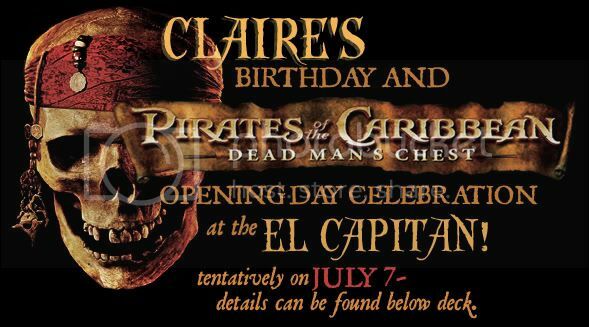 For those uninformed amongst my LA-based friends, my birthday this year falls, quite conveniently, onJuly 7th- that is, Dead Man's Chest's opening day. Rather than letting this go unnoticed, I thought it would be fun for some of us to get together for dinner at Hamburger Hamlet on Hollywood Blvd. and then swasbuckle our way down the street to the El Capitan Theatre for an 8:00 showing of Pirates... All in full costume, of course, though I can hardly make it mandatory. I'd really like to get this to work, but I figured I'd fish for a bit of an estimate as to how many of you would be interested. Tickets can already be ordered over the phone for the El Cap, so planning ahead seems like a good idea... There is also a midnight showing the night before, on the evening of the 6th, but the idea of a full Friday night out sounded more promising. Besides, then we can come back to my house afterwards for cake and watching of things or whatnot. We shall see!